Page title: How Much of a Doctor’s Diagnosis Is Gut Feeling? How Much of a Doctor's Diagnosis Is Gut Feeling? Amitha Kalaichandran is a resident physician in pediatrics, an epidemiologist, and a health and science journalist whose work has been featured in Maclean's, National Post, CBC, Quartz, and New Scientist. Jonathan Sherbino was nearing the end of his solo, nine-hour shift one December evening in 2011 at an emergency room in Hamilton, Ontario. He’d spent much of the day peering at ear canals, taking throat swabs, and ordering X-rays in quick succession with few breaks. As the only doctor present, he knew he couldn’t linger for too long on any one diagnosis. A three-year-old with ruddy cheeks was next in line, her nose running profusely and mixing with the warm tears streaming down her face. When Sherbino examined her, she seemed to have all the telltale signs. Fever: check. Cough and runny nose: check. Contact with someone who had the flu: check. Nothing appeared unusual in her medical history. It was likely she had the flu. But as Sherbino, an emergency physician at St. Joseph’s Healthcare Hamilton, prepared to sign a prescription pad for an antiviral medication, something forced him to slam the brakes. “It was as though I couldn’t keep writing,” he later told me. “My mind was stopping me…it was like a cognitive block. Something just didn’t fit the clinical picture.” He returned to the mother to ask her a few more questions. The child’s fever, it turned out, was on its fourth day, which was somewhat odd—for most children, in his experience, a flu-related fever lasts two or three days. Her lips were also peeling—a symptom not usually associated with the flu. “It could very possibly be Kawasaki disease,” Sherbino recalled thinking at the time, referring to a childhood disease of unknown cause. Its symptoms often include at least five days of fever, red eyes, swollen lymph nodes, and a rash, along with other signs that appear later. It is also rare: in many Western countries, the disease occurs in one in every 10,000 children under the age of five. He knew if his hunch were correct, the toddler’s condition would quickly worsen—she might even develop a coronary artery aneurysm, which can lead to a heart attack and death, in some cases. Once Sherbino explored the symptom history further, Kawasaki more clearly fit the clinical picture. Sure enough, when the child was transferred to a local children’s hospital the following day, Sherbino’s diagnosis was confirmed, and the toddler received timely treatment that likely saved her life. The incident led Sherbino, who is also the assistant dean of education research at McMaster University’s Faculty of Health Sciences, down a new path in his work. It wasn’t conscious logic that hadinitially compelled him to revisit his initial diagnosis. Some might call it a gut feeling. Others have a medical term for it. With his colleague and mentor, Geoffrey Norman, Sherbino has been studying what’s known as “clinical intuition” (or “diagnostic reasoning”) for the past eight years. Sherbino and his research team at McMaster describe clinical intuition as a process by which medical practitioners form a hypothesis quickly and then verify it though more analytical means. Over time, and with experience, clinical intuition is thought to become more accurate, and the analytical process occurs more quickly. But it is also a skill that can be taught and honed, Sherbino says. And in time-limited situations, such as emergency-department examinations, he believes, it could help more doctors separate common coughs and colds from rare, devastating, and maybe even fatal diseases. As a physician myself, I learned anatomy, physiology, evidence-based medicine, how to record a medical history, and physical-exam skills in medical school. If they’re lucky, medical students improve their empathy and listening skills from role models. Now, as a pediatrics resident, I realize that clinical intuition is not a skill students are formally taught. Medical practitioners have historically favoured a slow, analytical approach to decision making: students are usually taught to list symptoms that support a particular diagnosis, as well as those that might contradict it, before coming to a conclusion. Although some in the medical community see promise in clinical-intuition research, to critics, the idea is not established enough to risk altering a centuries-old canon of medical teaching. Pat Croskerry, an emergency-room doctor and director of the critical-thinking program at Dalhousie University’s division of medical education, has penned letters to the journal Academic Medicine drawing caution to research done by Sherbino and his team. Croskerry studies how physicians can avoid cognitive biases—errors in thinking—that can lead them to hold onto the first diagnosis that comes to mind, even if new information contradicts it. Lowering the rate of misdiagnoses—estimated to be at about 10 to 15 percent of all cases—is a widely held goal in the medical community. Croskerry believes that what Sherbino and others call clinical intuition could be termed “fast decision making,” which allows us to make quick associations between ideas. (A kid with a runny nose, muscle aches, and fever around family members with the flu? Must be the flu.) He says an overreliance on fast decision making can lead to harmful dependence on common cognitive biases. “We can and do use [fast] decision making extensively,” Croskerry says. “But we should always be checking it with our slower, methodical, evidence-based mind.” It’s the latter component, he says, that becomes stronger with increased experience and knowledge: over time, as they see more cases, doctors and nurses are able to eliminate wrong diagnoses more quickly. He may be right. One night, when I was a junior resident, another resident and I admitted a child with joint pain. The patient’s condition seemed to both of us most in keeping with an autoimmune disease, and though we each came up with slightly different diagnoses, we used a slower, analytical approach—the one we’d been taught throughout our training. We knew there was a possibility it could be a serious infection, but we didn’t consider it likely until we reviewed the case with a more experienced resident. Though the patient didn’t demonstrate a true fever—a sign of an infection—our colleague was inclined to think the pain was caused by a bacterial infection, possibly based on an eerily similar case he had seen the year before. He turned out to be right, and the patient was soon given high-dose antibiotics to fight the infection. If the diagnosis had been missed, it would have been devastating for the patient. It’s hard to tell whether clinical intuition prompted my colleague to rethink our diagnosis or whether his additional years of experience simply allowed him to draw on more data. But even if clinical intuition is effective, so far the available research is unclear to what extent medical practitioners should rely on it. Despite their competing priorities, Sherbino and Croskerry seem to be tackling the same systemic problems: as the demands on Canada’s health system continue to increase, manifesting as longer wait times and overflowing emergency rooms, doctors and nurses are having to make decisions in high-stress situations on a daily basis, often with limited resources and time. 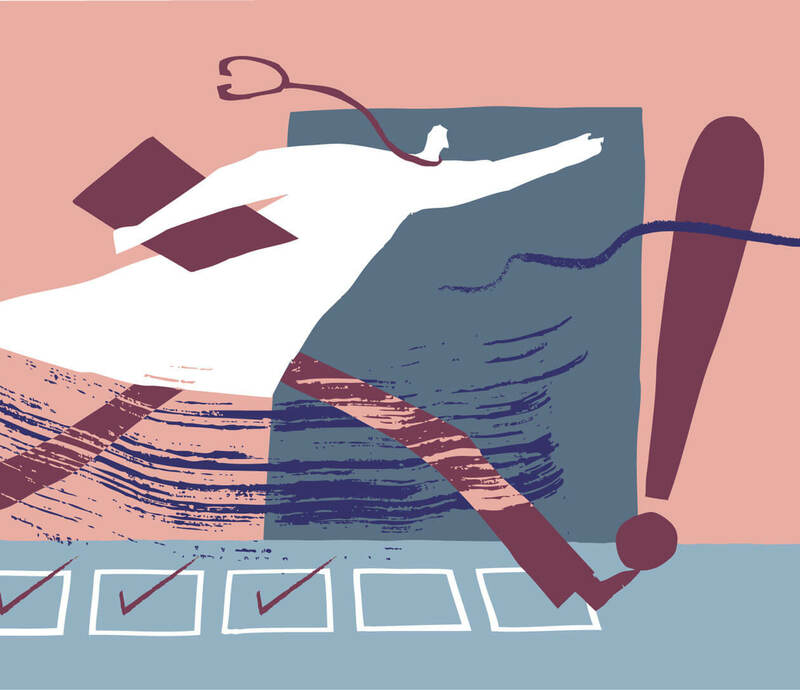 For early career medical practitioners, then, is a shift toward a more instinctive approach—one that defies the traditional method—inevitable? The key to avoiding misdiagnoses, it turns out, may have less to do with the decision-making process itself than with confidence in one’s decisions. And confidence and experience don’t necessarily go hand in hand. A recent paper, co-authored by Carmen Sanchez, a PhD candidate at Cornell University, included several studies that surveyed participants tasked with making decisions about whether a patient was healthy or had one of two “zombie diseases”—fictional illnesses with made-up symptoms that were created for the purposes of the studies. The participants, none of whom were formally trained in clinical medicine, were asked how confident they were in each of their diagnoses beforereceiving feedback about whether they were accurate. Though the participants’ accuracy slowly and incrementally increased with experience, their confidence followed a different pattern. At first, the novices were aware of their inability. After just a little learning, their confidence shot up, though their actual performance hardly changed. Toward the end of the experiment, their confidence increased again, possibly because their accuracy improved and they had seen more subjects over time. With rising pressures in health care, physicians at all levels of training may be forced to make efficient decisions about anything from triaging which patients are sick enough to be admitted to which are more likely to have symptoms suggestive of a devastating disease, all while minimizing the risk of misdiagnosis. Clinical intuition, if used appropriately, and when drawn from a vast pool data from a doctor’s own experience or that of others, may be one way to help make accurate diagnostic decisions when the stakes are high and time and resources are limited. The best cases, I suspect, are when decisions are made with humility, through consulting with those more experienced, to effectively crowdsource the diagnostic possibilities, and taking a more analytic approach whenever possible.